Matt Lopez of Due West was presented a Gold Record by Lady Antebellum. 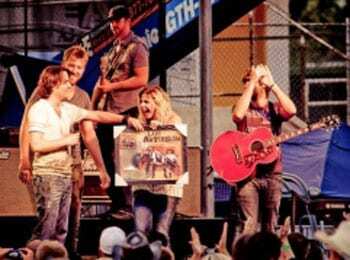 Matt Lopez of the new country trio Due West was recently presented with a Gold record by Lady Antebellum while on tour. Due West opened for Lady Antebellum in St. George, Utah and Lopez got a change to perform the song he co-wrote, “Love’s Lookin’ Good On You,” which is on Lady A’s album. alli spokeswoman Wynonna Judd held a private performance recently at the Country Music Hall of Fame for 50 sweepstakes winners. The event celebrated her progress since starting the alli method, which has included dropping 2 dress sizes. Jake Owen launched a fan club and new website, www.jakeowen.net, this week. The new fan club will include a free three-month membership for every user who was a community member on the original website. Otherwise, the yearly rate will be $9.99, offering access to video updates from Jake on the road, tour photos, Jake’s personal photos from his days off on the road, access to meet ‘n’ greet passes, and other cool features. He also recently filmed the video for latest single “Eight Second Ride,” which is slated to debut this summer. TelluRide has been spending time in their home state of Washington performing homecoming shows and visiting radio in the Seattle area and Spokane to celebrate their debut American Roots Records single, “Pencil Marks” and Four Square Miles album. The band played two nights at the popular Tenino Wine & Music Festival, and visited Microsoft to perform for the staffs of WindowsMedia, Zune and Microsoft’s Xbox. Richie McDonald’s song “Race Day” is being be used during pre-race programming on the SPEED network during the 2009 NASCAR Season. McDonald recorded the song he wrote with Aaron Barker and Leslie Satcher for his forthcoming solo debut on Stroudavarious Records, due in 2010. A song written by Craig Bickhardt and Don Schlitz offers a humorous look at modern baseball vs. the sandlot and the diamond’s glory days. The cut, performed by Bickhardt, also features Terri Hendrix, Lloyd Maines, Andy Leftwich, Byron House and Tommy Geddes. Click here to see the YouTube video.